Boil a large pot of water and prepare pasta according to package directions. Meanwhile, heat the butter and garlic in a medium pot until bubbling. Add flour, salt, and pepper, whisking constantly until well combined, and cook until it begins to turn lightly golden. Quickly whisk in the chicken stock, ensuring all lumps are gone. Allow to simmer slightly over medium to low heat. Whisk in the milk, still stirring to ensure nothing globs to the bottom of the pan. Stir for 8 or so minutes until the mixture thickens slightly. Add the peas and chicken to the sauce, stirring until well combined and warm. 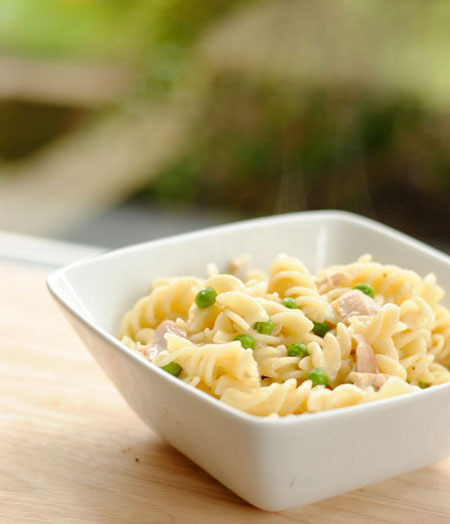 Combine the sauce with the cooked and drained pasta, stirring together until pasta is evenly coated. Serve hot, or store in an air-tight container in the fridge or freezer.